President Jacob Zuma’s speechwriters and foreign policy advisers must have been as startled as the European Union (EU) ambassadors when he launched into a broadside against Europe this week, blaming it – entirely – for the huge influx of migrants across its borders. Giving his annual briefing to ambassadors, Zuma was chugging along nicely, sticking to the script in which his advisers struck a conciliatory tone. ‘The impact of wars and poverty in the world is manifested through the expanding refugee crisis,’ he said, casting the net wide as to the causes of the crisis. The solution to the ‘painful human tragedy of over four million Syrian refugees’ was to stop the war in Syria. Then the speech went on to talk about conflicts and security crises in Africa. 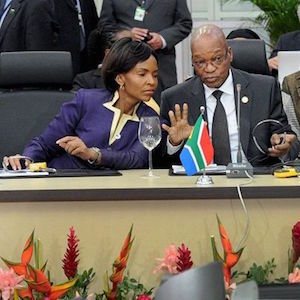 When it came to Libya, Zuma read from the script that South Africa fully supported the UN-led political dialogue among Libyan rivals to try to end the conflict. But the mention of Libya seemed to throw the switch to the points and Zuma then veered off the script into an impromptu attack on the EU. ‘Before the Arab Spring and before the killing of Gaddafi there were no refugees flying or flocking to European countries. It was all quiet. Things were normal in the north of Africa,’ Zuma insisted. It was NATO’s (North Atlantic Treaty Organization) bombing of Libya and the killing of its leaders that had undermined the country’s security and ‘opened up the floodgates’ of migrants. In other words, you made this bed, you sleep in it – alone. Gone was the sense of wider causes, of solidarity in finding solutions, of pledges of support and the humility and empathy of a fellow-sufferer, which the speechwriters and advisers had evidently put into the speech. There was a grain of truth in Zuma’s unscripted analysis of the migrant crisis but it was narrow, deficient, accusatory and sometimes just plain wrong. No doubt NATO’s intervention contributed to the toppling of Muammar Gaddafi and therefore to the power vacuum that has turned Libya into ungoverned space, allowing human traffickers, unfettered, to launch tens of thousands of migrants from its shores towards Europe. Let us remember though, that the UN agreed on the intervention in Afghanistan. And what of Gaddafi himself – and the other brutal dictators like Syria’s President Bashar al-Assad, Iraq’s Saddam Hussein, the Taliban and Eritrea’s Isaias Afewerki? Do they not share some blame for the exodus from those countries? Implicitly dismissing Zuma’s analysis, EU Ambassador Roeland van de Geer, veered to the opposite extreme saying ‘the cause of the crisis in North Africa lies squarely with its own leaders; the lack of democracy and the lack of the rule of governance.’ As far as that referred to Libya, it conveniently ignored the degree to which NATO converted the UN mandate to protect civilians in Benghazi into a regime change agenda. But more generally it was a useful reminder that the migrant crisis has many causes. And so Zuma’s speechwriters were right to propose that the European migrant influx is a global crisis. That was why they said the UN will have to deal with. And why EU and AU leaders are holding a summit on the topic in Malta during November. But the more interesting question is why did Zuma depart from the balanced text, presumably provided by the Department of International Relations and Cooperation advisers, to deliver this one-sided view? Does he still feel guilty about that vote for Resolution 1973? Zimbabwean President Robert Mugabe is certainly one person who won’t let him forget. At the June AU summit, Mugabe seized on that vote by South Africa and Nigeria to suggest Africa would never trust them as its permanent representatives on the UN Security Council. And is Zuma also diverting attention from his own still murky role in the peace initiative in Libya in 2011? While representing the AU, which had taken a position that Gaddafi should personally step back from power in a transitional government of national unity, Zuma was instead then privately advocating Gaddafi’s continued participation in government, according to opposition leader Mahmoud Jibril. Or perhaps Zuma’s ad-hoc foreign-policy-making this week simply boils down to the fact that he is just not a foreign policy president. He is a politician and perhaps he wanted to insert his party’s tough ideological stance into the speech – the spirit of the African National Congress’s (ANC) latest foreign policy discussion document that is full of anti-imperialist dogma. Doing that helps to bolster his standing in the party (at a time, incidentally, when speculation is surfacing that he may seek a third term as ANC president). Gratuitously irritating South Africa’s largest trade and investment partner at a time when the present state of the economy suggests the country needs all the friends it can get, seems unwise. But it may be less important than playing to the populist gallery in the Tripartite Alliance to sustain his own support.